Since 1986, the Department of Chemistry and Biochemistry has brought together past and future generations of chemistry professionals through an annual lecture series, the Auburn – G.M. Kosolapoff Award Lecture, which is sponsored by the American Chemical Society, Auburn Section. Speakers from prestigious universities including Harvard, Purdue, Stanford, Columbia, and the Massachusetts Institute of Technology have shared their research at Auburn University for this event over the past three decades. 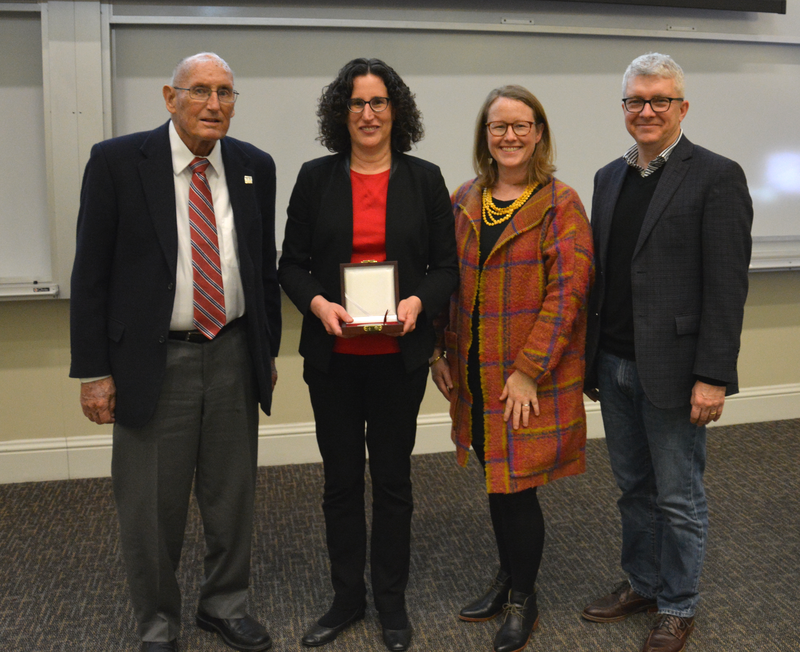 The 2019 recipient of this award is Dr. Sharon Hammes-Schiffer from Yale University. Dr. Hammes-Schiffer spoke on February 13 on the topic Enzymes: The Engines of Biology. She shared insight about chemical reactions in condensed phases. The three areas of her research includes proton-coupled electron transfer reactions, enzymatic processes, and non-Born-Oppenheimer electronic structure methods. After her presentation, she was presented with the Kosolapoff medal for her scientific achievement. Dr. Hammes-Schiffer is the John Gamble Kirkwood Professor of Chemistry at Yale University. She is a member of the American Academy of Arts and Sciences, the U.S. National Academy of Sciences, the International Academy of Quantum Molecular Science and the Basic Energy Sciences Advisory Committee. She has published more than 240 peer-reviewed scientific articles and has been invited to more than 370 lectures. (Left to right): Mike Kosolapoff, Dr. Sharon Hammes-Schiffer, Lara Kosolapoff-Wright and Jerry Wright at the 34th Annual Auburn – G.M. Kosolapoff Award Lecture. Lara Kosolapoff-Wright shares the importance of this lecture series, "Members of our family have attended the series of Kosolapoff Award lectures to show appreciation to the Auburn chapter of the American Chemical Society, as well as the entire chemistry faculty, for remembering my grandfather's contributions to research and, more importantly, teaching, by inviting such outstanding and well-respected chemists to speak in Auburn. He had many interests but none greater than teaching his students at Auburn University -- sometimes even outside of his department. I love coming to the lectures with my family and wondering what impact the lecturers will have on all the students in the audience, especially the undergraduates. I think my grandfather would be honored to be remembered with such an outstanding lecture series." View past recipients of the award or watch Dr. Hammes-Schiffer’s presentation below.